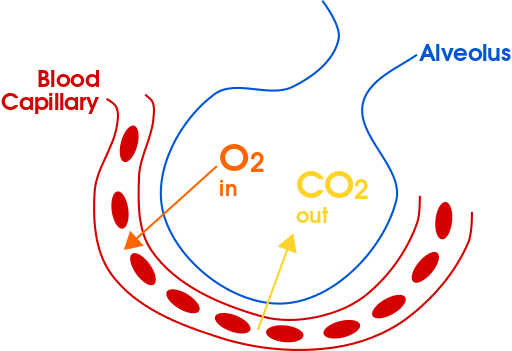 Respiration is the transport of oxygen to the cells within tissues and the transport of carbon dioxide in the opposite direction. External respiration describes the exchange of gasses between the external environment and the bloodstream. The components of external respiration include alveolar surface area, ventilation and perfusion matching, and partial pressure gradients. Partial pressure gradients allow gasses to flow from areas of high pressure to areas of lower pressure. Ventilation and perfusion in the alveoli must be balanced to maintain efficient gas exchange. passive diffusion: The net movement of material from an area of high concentration to an area of lower concentration without any energy input. perfusion: The blood supply to the alveolar capillaries that must be balanced with ventilation. Equilibrium: The rate of change of the gasses in the alveoli and capillary become equal to eachother at the end of gas exchange. External respiration is the formal term for gas exchange. It describes both the bulk flow of air into and out of the lungs and the transfer of oxygen and carbon dioxide into the bloodstream through diffusion. While the bulk flow of air from the external environment happens due to pressure changes in the lungs, the mechanisms of alveolar gas exchange are more complicated. The primary three components of external respiration are the surface area of the alveolar membrane, the partial pressure gradients of the gasses, and the matching of perfusion and ventilation. The alveoli have a very high surface area to volume ratio that allows for efficient gas exchange. The alveoli are covered with a high density of capillaries that provide many sites for gas exchange. The walls of the alveolar membrane are thin and covered with a fluid, extra-cellular matrix that provides a surface for gas molecules in the air of the lungs to diffuse into, from which they can then diffuse into the capillaries. Partial pressure gradients (differences in partial pressure) allow the loading of oxygen into the bloodstream and the unloading of carbon dioxide out of the bloodstream. These two processes occur at the same time. Gas exchange in the alveolus: External respiration is a result of partial pressure gradients, alveolar surface area, and ventilation and perfusion matching. Oxygen has a partial pressure gradient of about 60 mmHg (100 mmHg in alveolar air and 40 mmHg in deoxygenated blood ) and diffuses rapidly from the alveolar air into the capillary. Equilibrium between the alveolar air and capillaries is reached quickly, within the first third of the length of the capillary within a third of a second. The partial pressure of oxygen in the oxygenated blood of the capillary after oxygen loading is about 100 mmHg. The process is similar in carbon dioxide. The partial pressure gradient for carbon dioxide is much smaller compared to oxygen, being only 5 mmHg (45 mmHg in deoxygenated blood and 40 mmHg in alveolar air). Based on Henry’s law, the greater solubility of carbon dioxide in blood compared to oxygen means that diffusion will still occur very rapidly despite the lower partial pressure gradient. Equilibrium between the alveolar air and the capillaries for carbon dioxide is reached within the first half of the length of the capillaries within half a second. The partial pressure of carbon dioxide in the blood leaving the capillaries is 40 mmHg. The exchange of gas and blood supply to the lungs must be balanced in order to facilitate efficient external respiration. While a severe ventilation–perfusion mismatch indicates severe lung disease, minor imbalances can be corrected by maintaining air flow that is proportional to capillary blood flow, which maintains the balance of ventilation and perfusion. Perfusion in the capillaries adjusts to changes in PAO2. Constriction in the airways (such as from the bronchospasms in an asthma attack) lead to decreased PAO2 because the flow of air into the lungs is slowed. In response, the arteries being supplied by the constricted airway undergo vasocontriction, reducing the flow of blood into those alveoli so that the perfusion doesn’t become much greater relative to the decreased ventilation (a type of ventilation–perfusion mismatch called a shunt). Alternatively, breathing in higher concentrations of oxygen from an oxygen tank will cause vasodilation and increased blood perfusion in the capillaries. Ventilation adjusts from changes in PACO2. When airflow becomes higher relative to perfusion, PACO2 decreases, so the bronchioles will constrict in order to maintain to the balance between airflow (ventilation) and perfusion. When airflow is reduced, PACO2 increases, so the bronchioles will dilate in order to maintain the balance.